I have two mini cleanser samples but neither is full so I am bringing both to ensure I have enough to last the 11 days because I'll have be cleansing 3 times a day (morning, to remove spf and again at night). The first is Fresh Soy Cleanser, which I will definitely be buying a full size of. It's a gel cleanser that is light in texture and it breaks down makeup and cleanses my skin without stripping it. I also have Aurelia Miracle Cleanser, which makes my skin so clear that it is almost translucent and it is great for keeping breakouts at bay. Full review here. I am addicted to using my Sarah Chapman Facialift, so I am bringing that too. I find it really relaxing and my skin has been glowing since I started using it so I don't want to be without it for almost 2 weeks! I tend not to use chemical exfoliators when I'm on holiday but still need to exfoliate my skin so instead, I am bringing Tatcha Classic Rice Enzyme Powder, which is very similar to Dermalogica Microfoliant. It's in powder form, which I mix with water to form a foamy paste, which I then massage into my skin in circular motions before rinsing to reveal glowing, smooth skin! I absolutely love Omorovicza Queen of Hungary Mist so I have to bring it, plus this is a travel size bottle so I'll be able to bring it on the plane to refresh during the flight. The scent is calming and the spray is uber-fine so it's also perfecting for refreshing my makeup. This mini tube of Sarah Chapman Age Repair Serum will be perfect for both day and night use. It's lightweight, but very nourishing and it helps with stubborn pigmentation. I have probably just enough Clarins Eye Contour Balm left in the tube to last me for the holiday and the small, plastic tube is perfect for travelling. I love this eye cream - it really hydrates and plumps the entire eye area! For my daytime moisturiser, I am bringing Omorovicza Illuminating Moisturiser, which is a travel size. This is light in texture, yet delivers a powerful dose of moisture and really brightens and nourishes the skin. At night I'll be using Omorovicza Rejuvenating Night Cream, which is rich in texture and really soothes and moisturises my dry skin. All Omorovicza products are very soothing, making them perfect for stressed, sensitive and reactive skin. Of course, I couldn't not bring some face masks with me! I have two samples of Charlotte Tilbury Goddess Skin Clay Mask and although I'm not the hugest fan of her other skincare products, the more samples of this mask that I use, the more I like it and I can see myself buying a full size at some point. This makes my pores appear refined and my skin feel smooth. I am absolutely obsessed with the Clarins SOS Comfort Face Mask because it really plumps my skin and using it overnight means I wake with soft, radiant, hydrated skin. I may even use it as a quick fix after a day in the sun before doing my evening makeup. Review here. 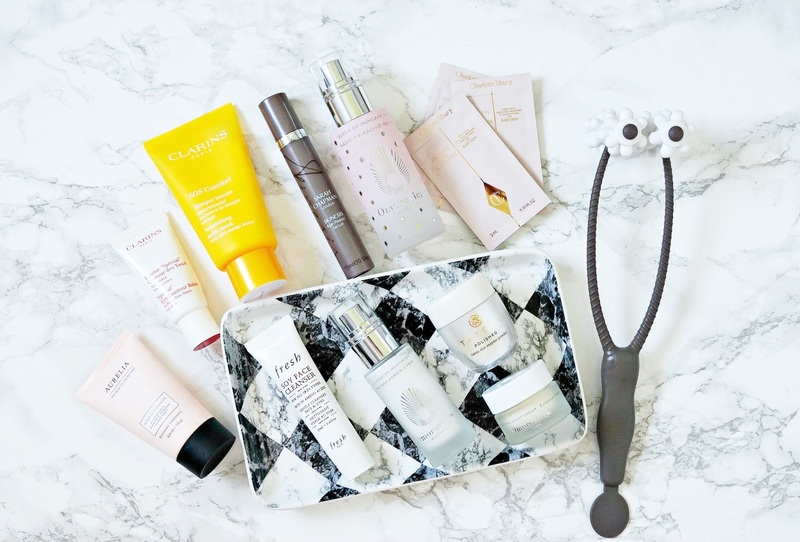 Usually, my favourite part of coming home from holiday is getting back to my skincare stash but I think the longing won't be so bad this time as I have a lot of my favourites with me! Do you pack everything but the kitchen sink skincare wise when going on holiday or are you more streamlined? I'd love to hear! I won't be posting here while I'm on holiday because I just want to switch off and enjoy the time with my husband so I'll see you on the 24th with a new post! All products are bought by me, unless otherwise stated. The Omorovicza moisturisers and mist were kindly sent to me, as was the Clarins mask. Opinion is always my own.